September 25, 2017, 9th arrondissement of Paris, Unitouch once again received the French beauty award “Les Victoires de la Beauté”at the stage of Theatre de Paris and walked away three trophies. This is a glory night to Unitouch, the world’s first “Zero Concer”skin care products . 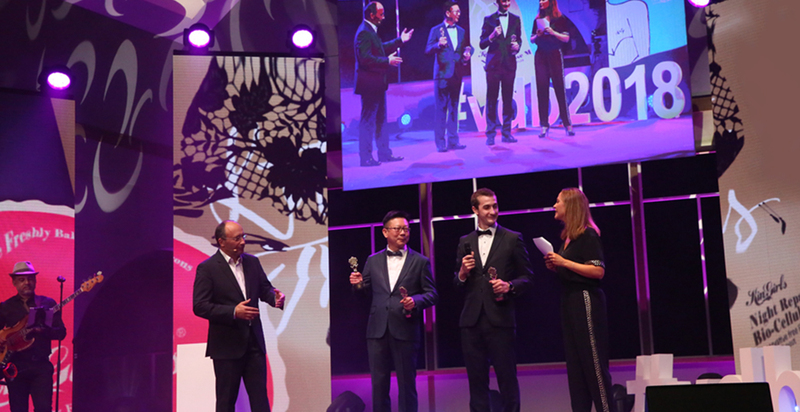 After the Sephora's exclusive release of the brand Unitouch event, we flew to Paris to receive the French beauty award “Les Victoires de la Beauté”. Through the French strict blind evaluation, in the continuity with 2015 and 2016 awards, demonstrating once again, Unitouch’s “Zero Concern”skin care products are among the best. The same award receivers are CARTIER and ELLE. In March 2017, Unitouch Garden face mask sold at Le Bon Marché, the world’s most high class department store, for Sincell mask 10 EUR per piece and Bio-Cellulose mask 12 EUR per piece. Unitouch’s eye mask will debut at Le Bon Marché in December. In June 2017, Unitouch So What face mask officially sold at Sephora China and the price is 138 RMB (3 pieces). September 26, 2017, our clients witness Unitouch received the French award “Les Victoires de la Beauté” for three consecutive years with our “Zero Concern”skin care products. We never stop the pace of progress. In November 2017, Unitouch BAD GIRL face mask will officially sold at Sephora China exclusively and the price is 158 RMB per box (3 pieces).